Crossing Atmospheres presents screen-based works by six artists who use the possibilities of video editing, digital compositing, sculpture and performance to explore the border between natural and synthetic environments. In doing so, the works express the permeability of this boundary and present their environments as a palimpsest, an accumulation of countless layers. The binary between an original nature and human intervention dissolves amongst the relentless flux of atmospheric conditions. IMAGES | Joe Hamilton, Regular Division, 2014. 57sec (loop) | Michael Meneghetti, Scartato: Brooklyn, 2015. HD Video. 9min 33sec. Image courtesy of the artist and photo by Melissa Edwards | Travis H Heinrich, Prosthetic Sky, 2013, HD Video. 19min22sec. Sound | UuDam Tran Nguyen, Serpents’ Tails, (still) 2015, three-channel video installation. 15min 16sec. Music by Tôn Thất An (Aaken). Edited by Hồ Ngọc Đức (Draco Film). Guest Editor Nguyễn Đức Tú. Supported by CDEF & QAGoMA APT8 | Zoe Scoglio, Land Forms I, 2013, single-channel HD video |Images courtesy of the artist. Virtual, instantaneous and immutable, the digital era promised immateriality. However, as Sean Cubit has argued, this depends on the way in which you choose to measure the digital. While the internet can be said to weigh 0.2 millionth of an ounce, when measured in terms of the weight of electrons moving through it, it might be more useful to measure the weight of the internet in terms of the hardware used to support it. If we consider the weight of the internet in these terms, its weight increases exponentially each year, as new phones, tablets, monitors and hard-drives replace old at increasingly rapid rates, leaving a large proportion of this hardware sitting in landfill. This is before we begin to account for the infrastructure used to support the internet, such as Google server farms, as well as the power consumed by this infrastructure and its connected devices. The immateriality that seems to define the way images and information move in and out of view, as we flick through web pages, apps and programs, obscures the physical presence of the objects that facilitate our experiences and the environments they affect. Crossing Atmospheres brings together six artists who use screen-based works to engage with ecological concerns and explore the border between natural and synthetic environments. In doing so, the works express the permeability of this boundary and present their environments as a palimpsest, an accumulation of countless layers. The binary between an original nature and human intervention is seen to be untenable within each of these works. Michael Meneghetti’s Scartato: Brooklyn is a performance documented on video. It simply and viscerally reminds us that the things we discard as rubbish remain within the environment. 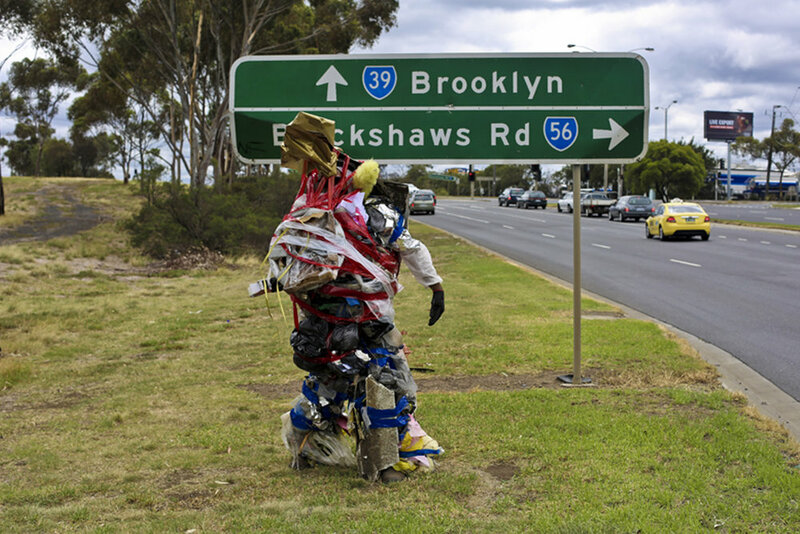 Walking through suburban environments, Meneghetti collects and tapes to his person discarded litter from residential streets, industrial areas and nature strips. As he disappears beneath the accumulation of rubbish, he takes on the form of a monster. The litter that we accept as part of the suburban environment becomes grotesque when amassed within proximity to the human form. Default Collective’s work Lead, Cadmium, Mercury directly addresses the accumulation of e-waste. Displayed on a CRT monitor and an early generation LCD screen, both monitors are in working order, but can be understood as obsolete due to changes in technological standards. 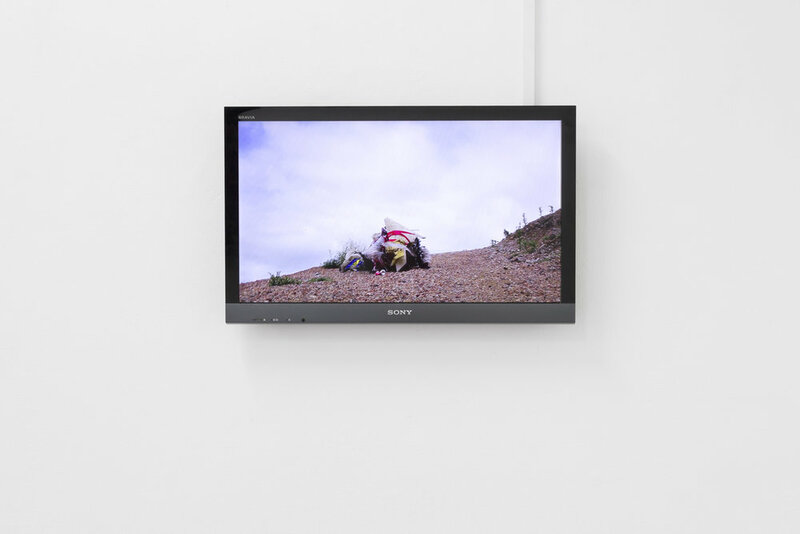 The use of television monitors that were once commonplace in galleries directly addresses the issue as it relates to the display of video art and its complicity within cycles of obsolescence. The two screens are physically present in the gallery while also being represented in the videos. 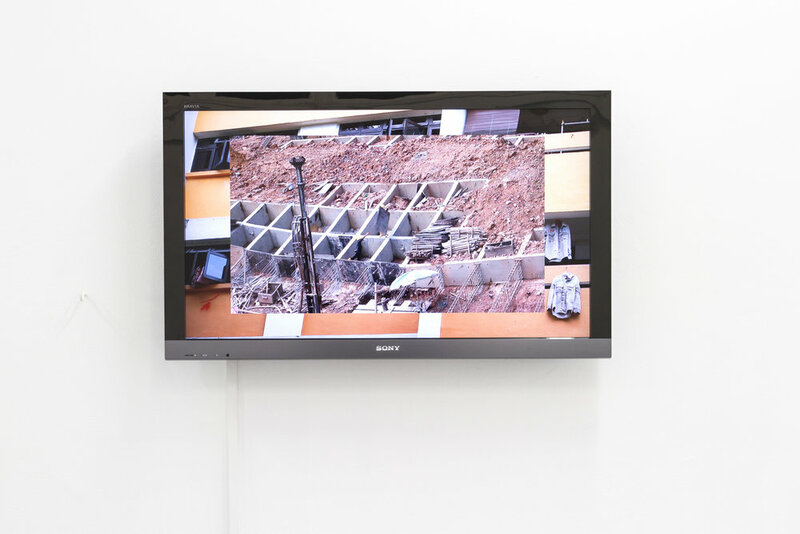 In the videos the monitors are seen abandoned in a bluestone gutter, assuming the form of hard rubbish. Similarly, for the gallery installation, the monitors are casually stacked in a corner of the gallery, surrounded by a mess of cables and equipment. 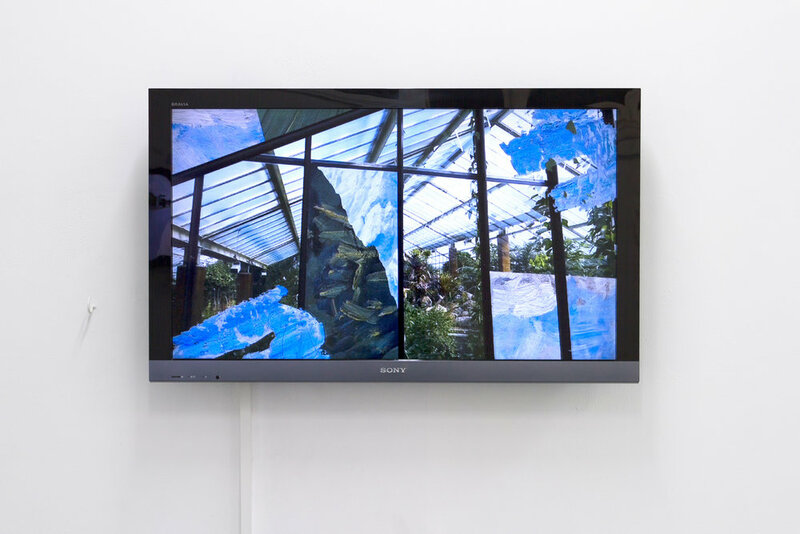 In the videos, an awkward digital collage of leaves sprouts over the televisions, obliterating their visibility in the urban environment. As the collaged vine turns orange, then red, the leaves fall and the video loops, yet the monitors remain, unaltered. This acts as a reminder of the permanence of these obsolete technologies, despite their absence from sight once they are discarded, and the title of the work references just three of the toxic materials the environment is exposed to when old monitors are dumped. UuDam Tran Nguyen’s Serpents’ Tails makes visible the pollution created by motorbikes in urban Vietnam. Usually remaining invisible as it enters the atmosphere, the pollution is made visually present in Serpents’ Tails via its capture in the brightly coloured and silver fabric pipes that weave through urban environments, entangling buildings and humans alike. There is something menacing about the proximity of these toxic ribbons to human bodies and environments, enhanced by the contrast between this toxic reality and the carnival-esque performances in which they are intertwined. Enclosed within the fabric, the work gives visual form to the toxins that comprise the atmosphere of the cities that we inhabit. Joe Hamilton’s Regular Division takes enclosed environments as its subject. The video uses intricate, dynamic editing and layering to combine footage of several indoor gardens spread across the world. These glasshouses aim to recreate pristine environments in terms of foliage, atmosphere and temperatures. Hamilton’s video, however, lingers on the points where natural elements meet the physical structures that support the enclosed environments, such as walls, paths and glass ceilings. Across the surface of the video, as though suspended in virtual space, are brushstrokes that allude to the painterly landscapes of Vincent Van Gogh and Arthur Streeton, drawing a connection between the different ways in which landscapes have been manufactured as image and environment. German philosopher Peter Sloterdijk argues that a crucial development of the twentieth century was the explication of the air, the recognition of the reliance of human life on specific atmospheric conditions. Following the increasingly apparent effects of human intervention in the Earth’s atmosphere, ‘Being’ was henceforth understood as always ‘Being-in-the-air’. Drawing partly from the work of Sloterdijk, Michael Wang draws a chilling comparison between the horror of the toxic gas cloud released in the Bhopal Disaster and the Kevin Roche-designed corporate headquarters of Union Carbide, the parent company of the plant from which the poison originated. Both the US-based headquarters and the disaster site in India reveal a disintegration of the separation of work and life within a continuous field of atmospheric conditions produced via corporate influence. In Bhopal, toxic chemicals from a factory were released into surrounding towns and the homes of sleeping workers, while the Union Carbide headquarters building was designed to create a condition of permanently secure interiority for its workers, in which one could park their (air conditioned) car metres from their office, and find all of their needs within a single, massive air-conditioned space. The people of Bhopal had absolute vulnerability to a poisonous industrial ‘reorganisation’ of the atmosphere, while the first world elite, working for the same company, dwelt in hyper-secure atmospheres in vast climate-controlled spaces. The Union Carbide building, situated within a forest and accessible only by car, was a financial failure, but it nevertheless typifies a crucial twentieth-century trend towards interior spaces and atmospheric control, as is evident in shopping centres and hotel atriums, filled with plants and glass. M. Christine Boyer describes such spaces as “sanitised human terrariums” which are fortified against the perceived dangers of the outside, from urban crime to the smog of poor air quality. 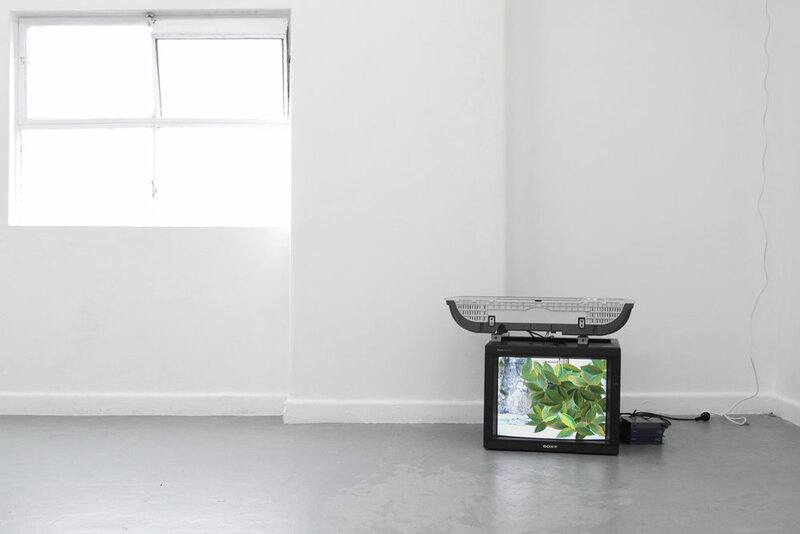 While Nguyen’s Serpents’ Tails inverts this relationship, producing toxic inflatable ‘interiors’, Hamilton’s Regular Division explores this more generalised condition of hyper-interiority via the emblematic form of contemporary glasshouses: indoor spaces of leisure filled with plant life. In one sense, such environments contain and package ‘nature’ for leisure consumption. Yet, such spaces also act as a metonym for the Earth’s atmosphere as a whole, which, like the glasshouse, is an environment that that has been (re)constructed via structures of glass and steel and mass air-conditioning, and from which ‘natural’ conditions can no longer be extricated. The form of the glasshouse serves less to preserve ‘nature’ than to undermine the very idea of natural conditions outside of the influence of human fabrication. Travis H Heinrich’s Prosthetic Sky documents the artist’s farcical attempt to make an atmospheric intervention of his own: an artificial ‘blue’ sky designed to offer a tantalising reprieve from Canberra’s perpetual grey. Initially developed as a satirical response to Canberra’s centenary celebrations in 2013, the work was inspired by the artificial Lake Burley Griffin which, now polluted, has become a distorted mutation of the ‘natural’ beauty that it mimics. Prosthetic Sky is composed of three lengthy static shots. Initially we see Heinrich’s ‘sky’, a large inflatable, partly inflated and floating, almost sulkily, in a back alley. In the next shot, we see the structure now floating high in the air. 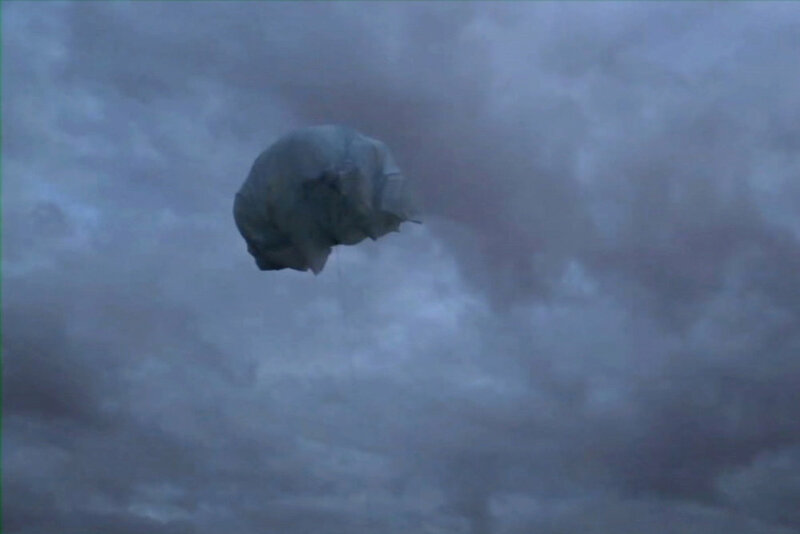 Airborne, Heinrich’s ‘sky’ appears only as a formless blob and is barely distinguishable from the grey sky it was to relieve, and is further flattened by its mediation in the form of heavily compressed video. The final shot of Prosthetic Sky presents a close-up of a fountain in Lake Burley Griffin, revealing a slight rainbow effect across the fountain’s mist. After its shambolic atmospheric protest, mimicking the failures of Canberra’s own attempts to create a natural picturesque beauty, the work seems almost resigned to return to the synthetic lake, where Heinrich finds a subtle, almost calming, aesthetic reprieve. 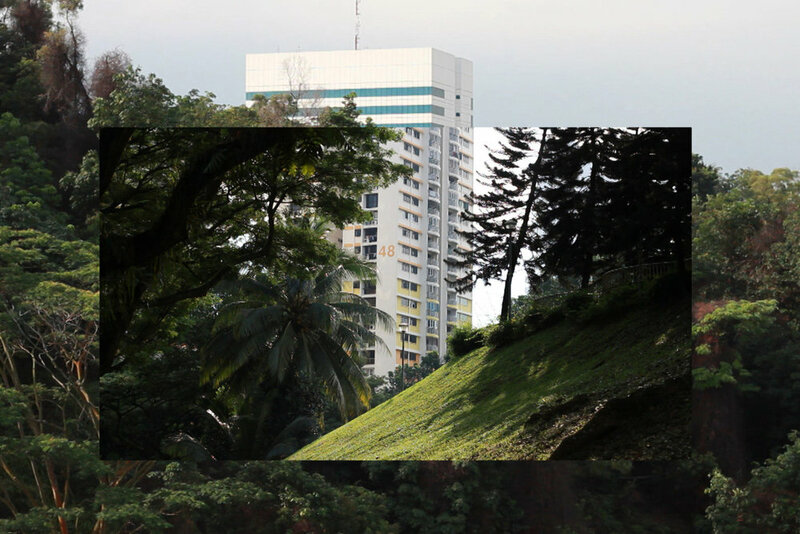 In contrast to Heinrich’s unruly sculpture, Zoe Scoglio’s Land Forms I, gives form to the entanglement of the natural and synthetic via a precise layering of video rectangles, with footage captured in Singapore. This city state, notoriously perceived as a site of control, is one of the ultimate examples of interiorised space, with its dizzying circuits of interconnected and architecturally ambitious shopping centres, immaculate landscaping and luxury hotels, reaching out from its immense airport. This is a form of interiority that reaches a crescendo in the surreal Star Trek-esque Gardens by the Bay, a nominal (theme) ‘park’ dominated by two immense glass and steel conservatories: the Flower Dome and the Cloud Forest, each designed to reproduce specific environmental conditions conducive to the plants they house. Atmospheric design, the capitalist technological response to the explication of the air, is leveraged here for intricately managed touristic consumption. Singapore’s relentless development, where its verdant environmental conditions are carefully packaged amongst architectural marvels, is an ideal site for Scoglio’s exploration of the relationships between the human and geological. The digitally composited cuts within each frame of Land Forms I creates a collaged temporality, possibly displaying multiple moments that have taken place on a singular site, but these same composites also instil the suspicion that we could never grasp or represent the ‘whole‘ site. Within this brief video, layers accumulate via patterns of superimpositions, framing and editing. Parallels and juxtapositions pile up among the images of Land Forms I, invoking themes of construction/decay, processed/unprocessed, habitable/uninhabitable, natural/synthetic. These binaries coalesce, antagonise and ultimately fragment across the hypnotic rhythms of Scoglio’s video collage. It no longer makes sense, or is even possible, to think of a nature ‘out there’ that we can return to, one disentangled from the synthetic. This is the preoccupation of all of the works here. Instead, there are only frames of reference with which to engage and interrogate these entanglements, these crossing atmospheres. Sean Cubitt. “The Weight of the Internet: Environmental Cost of Going Digital.” Artlink v.29 No. 4, 2009. p. 22. Peter Sloterdijk. Terror from the Air. 2002. Trans. Amy Patton and Steve Corcoran. Los Angeles: Semiotext(e), 2009. Michael Wang. “Into Thin Air.” Artforum May 2011. p.230-37. Jonathan Crary notes the significance that the poisoning occurred while the people of Bhopal were sleeping; in which the most basic security, a non-toxic atmosphere in which to sleep, was denied. Crary’s text, like Wang’s, also links this to a more general global condition: the eradication of any work/life boundary. Jonathan Crary. 24/7: Late Capitalism and the Ends of Sleep. London: Verso, 2013. Carter Wiseman. Twentieth Century American Architecture: The Buildings and Their Makers. 1998. New York: Norton, 2000. p.326. Boyer, Christine M. Cybercities: Visual Perception in the Age of Electronic Communication. New York: Princeton Architectural Press, 1996. p.166. One of the spaces that appears in Regular Division is the German theme-park, ‘Tropical Islands’, located on the outskirts of Berlin in a disused hangar designed to hold an experimental airship. The theme park is discussed briefly by Hito Steyerl as an example par-excellence of the move from production to post-production. 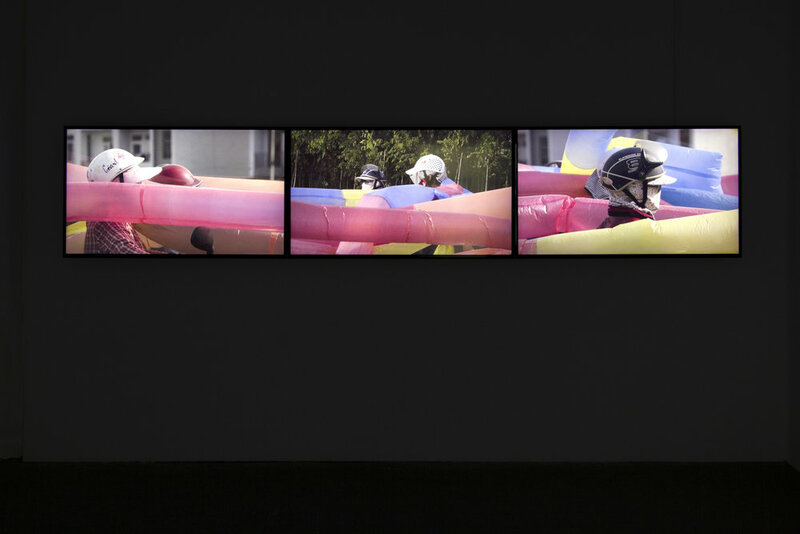 Notably, Steyerl comments on the number of inflatable elements within the theme park. See: The Wretched of the Screen. E-flux Journal. Berlin: Sternberg P, 2012. p.184-85. The lake is now regularly home to toxic cyanobacteria blooms caused by a high level of phosphates in the waterways feeding the lake. See, for example, the Lake Burley Griffin Action Plan: A Healthier, Better Functioning Lake by 2030 authored by the Lake Burley Griffin Task Force in 2012. Available online at: http://www.environment.act.gov.au/__data/assets/pdf_file/0003/576102/Lake_Burley_Griffin_Action_Plan.pdf. In 1993, William Gibson famously titled his essay on Singapore, “Disneyland with the Death Penalty” Wired Sept/Oct 1993. Available online: http://www.wired.com/1993/04/gibson-2/. See Sloterdijk, Terror from the Air, p.94-95. For a discussion of these themes in Scoglio’s work see: Emma McCrae. “A Site between Worlds: Zoe Scoglio.” Assemble Papers, 17 June 2016. http://assemblepapers.com.au/2016/06/17/a-site-between-worlds-zoe-scoglio/. McCrae notes that the transformative potential of the mass entanglement of bodies is crucial to much of Scoglio’s other work, and a similar concern is evident in Nguyen’s Serpents’ Tails, as discussed by Tarun Nagesh, “The Social Medium.” APT8: the 8th Asia Pacific Triennial of Contemporary Art. Brisbane: Queensland Art Gallery, 2015. p.138. Natasha Myers’s reflection on Singapore’s Gardens by the Bay, notes the importance of recognising that the project was built, and is maintained, by poorly paid, disenfranchised immigrant labour, in often dangerous conditions. Scoglio’s inclusion of images of such workers, slowly developing miscellaneous site, draws attention to the uneven distribution of Singapore’s luxurious urbanism. Myers also notes that Gardens by the Bay has overt apocalyptic themes, acting as a memorial to a world lost in the acceleration of climate change, rather than as a celebration of existing diversity (“Edenic Apocalypse: Singapore’s End-of-Time Botanical Tourism.” Art in the Anthropocene Encounters Among Aesthetics, Politics, Environments and Epistemologies. Eds. Heather Davis and Etienne Turpin. London: Open Humanities Press, 2015. 31-42. Timothy Morton presents a complex deconstruction of the idea of nature in ecological thought. See Ecology Without Nature: Rethinking Environmental Aesthetics. Cambridge, MA: Harvard University Press, 2007.